Many, MANY years ago, I snapped this picture as part of a photography project for art school. The assignment, to complete a set of pictures as part of a series, was a fun task that challenged my creative nature and technical skills. I decided to carry a bunch of bananas with me to various locations and take pictures of them in unusual situations. These locations ranged from a downtown city street to a hog lot at the Davis Purdue Ag Center. By the end of the project, the bananas were black, slimy and disgusting. I got an “A” on the project. It was after all, great art. My favorite shot occurred in front of the swing set while my nephews played in their back yard during a family gathering. 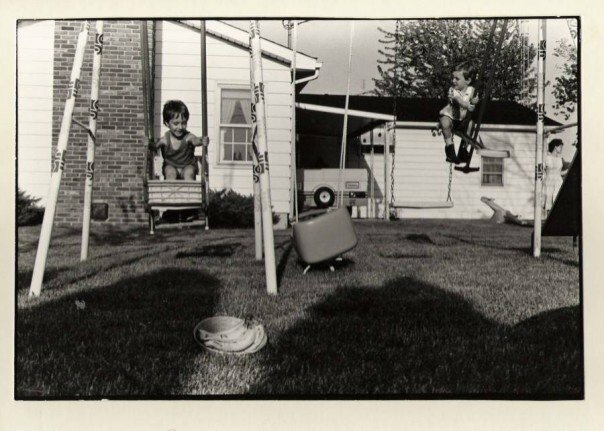 The picture itself won high praise from my professor who loved the angles (roof of the house, swing set, and shadows) , the compartmentalized individuals (my nephews, my father-in-law on the porch, my wife to the far right), and the action occurring while the fruit is in the foreground. This picture also is one of my favorites because it represents a more innocent time in our family’s life. It is a symbol of life “Before”. This shot was taken when the boys were young. It occurred when we were all living a more simple life. It was before tragedy had visited. It was before Alex’s accident and death. It was before Granny’s stroke, the cancer diagnosis, the fall down the stairs. It was before Alex’s accident, his death and funeral. It is a moment of time, captured in that perfect state with shadows stretching long over the newly cut grass, children’s laughter ringing in the air and the smell of barbeque lingering in the cool evening breeze. And it is a moment that will never be again. When this picture was taken, the bananas were still fresh and ripe in the basket. I love this picture…for so many reasons.